Engraving the Stanley Cup in #ALLCAPS is a real possibility this year. When the Washington Capitals took the Madison Square Garden ice on October 9, 1974 for the first time in their history—merely two months after President Richard Nixon resigned—few would have ever thought of mentioning the team’s name and Stanley Cup in the same sentence. They lost their opening game to the Rangers 6-3, en route to winning only 8 games of 80 in that miserable inaugural season. It shouldn’t have come as any surprise that the Capitals chose as their number one overall pick in the NHL amateur draft a player by the name of Greg Joly. Remarkably, they improved the next year with a whopping 11 wins out of 80 games played. There was a degree of success in the 1980s as the Caps were frequent visitors to the playoffs and even reached the third round. It continued through the 1990’s and made their only Stanley Cup finals appearance in 1998 only to be swept by the Detroit Red Wings 4 games to 0. The early 2000s saw the Caps return to league doormat status, and then the franchise changed dramatically with the signing of Alexander Ovechkin—clearly no Greg Joly who scored a whopping 9 goals in 98 games for the Caps—in 2004. A lockout cancelled the 2004-2005 Season, and Ovechkin began his storied career with the Caps in 2006. The Caps had a slew of outstanding players to this point though their post-season even with some dramatic moments did not bear fruit. Dennis Maruk, Mike Gartner, Peter Bondra, Dino Ciccarelli, Scott Stevens, Kevin Hatcher, Mike Ridley, Bengt Gustafsson and Olie Kolzig, were among the best in the league. But Ovechkin’s addition to the team was a franchise turning point. Not that any post-season success had been realized by the perennial division champs. 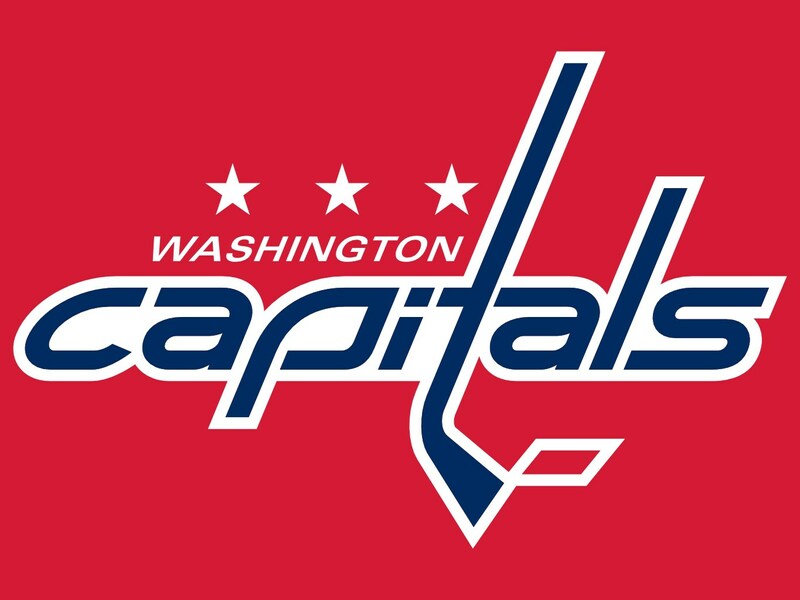 In the 2009-2010 Season, the Capitals won their first President’s Trophy—best record in the NHL—but faltered in the playoffs. They led the eight-seed Montreal Canadiens 3 games to 1 but couldn’t close it out. Each year failure in the post-season whether it be the first or second round became a cloud hovering over the team regardless who the general manager or coach may be. 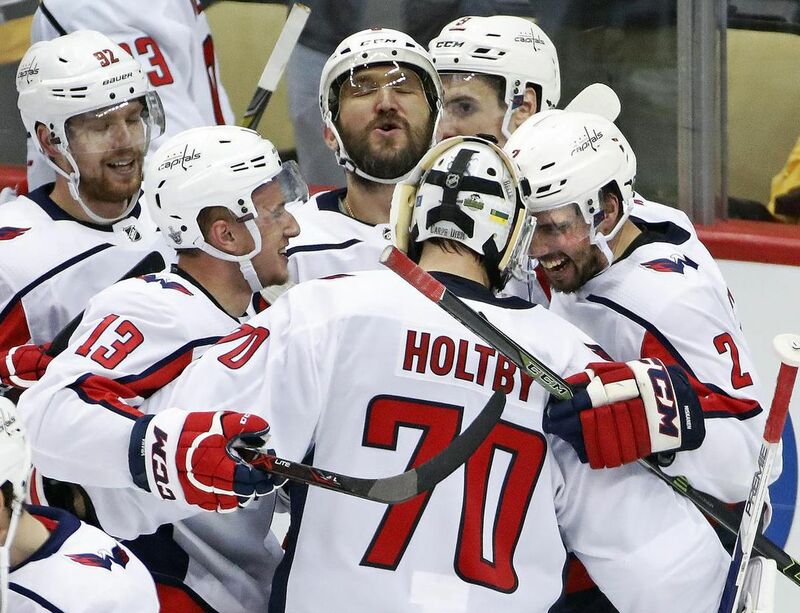 The Pittsburgh Penguins were the quintessential villains for the Capitals having won 9 out of 10 mostly tightly contested playoff series over the years. All that changed this year as the Caps eliminated the Pens 4 games to 2 in the second series (following a 4-2 series win over the Columbus Blue Jackets) and for only the third time, the Caps qualified for the third round. Optimism is running rampant among Caps fans as they took the first two games of the third round against Tampa Bay. Can this be the year the Capitals break through and even take the Cup? I believe so and here’s why. Winning on the Road. The Caps 7-1 record on the road in the playoffs so far is astounding. They took all 3 in Columbus, 2 out of 3 in Pittsburgh and is 2-0 in Tampa. To win a Stanley Cup, a team has to win outside their home rink (as well as winning on home ice). Defense First. The Capitals defensive style during the post-season is much tighter than the regular season. Players are more responsible and committed to defense; there is a good structure to their game; and they are bottling up the ice between the blue lines—similar to the style the New Jersey Devils employed over the years to great success. The Caps have also blocked more shots than any other team in the playoffs this go around. Goaltending is key. A team cannot capture the Cup unless the goaltending is stout. Braden Holtby was plagued by injuries and a lack of focus that resulted in a relatively disappointing regular season. Too many games were lost after having leads in the third period. Of course, that’s not all attributable to Holtby but some of it was. Accordingly, Philipp Grubauer, normally the backup goalie, started the first two games of the Columbus series and lost both—at home. Holtby started game 3 and has not looked back. His performance during the Penguins series was world class. Most of the few goals that were scored against him were as a result of deflections or shots that changed directions after hitting a player. He stopped virtually everything else. His Goals Against Average stands at a stingy 2.04 with a Save Percentage of .926—very impressive numbers. Balanced Scoring. No one seems to talk about it but the balanced scoring in the Capitals attack—should it continue—will likely result in a Cup win. During the regular season, Alex Ovechkin scored 49 goals to earn his 7th Maurice “Rocket” Richard trophy for the most goals scored in the league. Only Bobby Hull had that many Richard trophies. Ovechkin scored 19 percent of his team’s total goals. During the playoffs, Ovechkin hit the net 10 times and still accounts for 19 percent of the team’s total goals. But in only 14 games played so far, the Capitals have 16 players who have scored at least 1 goal with 12 of those scoring at least 2. Moreover, 20 different Capitals have at least a point during the playoffs. Those statistics are imposing given that teams tend to key on the number 1 line of Kuznetsov-Ovechkin-Wilson line. With so many other players chipping in, opposing coaches will be having nightmares trying to figure out match-ups. Intangibles. The Caps are playing with a chip on their shoulders, which has been well-earned from all their post-season disappointments. The Caps’ incredible edge on odd-man breaks has showcased the team speed and ability to finish. They can still use some improvement in certain areas, however, but their overall performance should overcome them. Though the penalty kill has faltered the past few games after an outstanding start, the power play continues to click. Remember, Niklas Backstrom, Tom Wilson and Andre Burakovsky have missed significant time during the playoffs. Wilson and Burakovsky have returned, and Backstrom is day-to-day. The Caps are playing with poise, confidence, grit and skill. 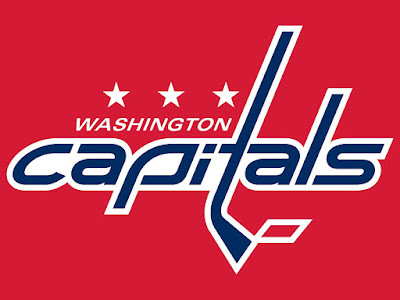 If they keep their focus, I expect the Cup to be hoisted by players wearing lower-case “capitals” on their jerseys. In these playoffs, it’s been #ALLCAPS. 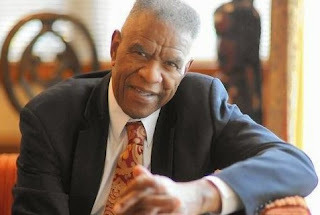 “Bob, more than many during these moments in time, understands and appreciates the importance broad visions, for the African American Coalition of Howard County has known this of Bob for many years,” said Howell. Bob Ford expressed his appreciation for the endorsement. Howell’s civil rights activism had its roots in the historic marches to Montgomery, Ala. According to the Baltimore Sun, at age 22, Howell and other bus passengers had traveled to Selma to join in the third march, which succeeded in reaching Montgomery on March 25, 1965. Along the way, their bus driver made a wrong turn at 5 a.m. and the group was met by white people wielding ax handles and guns, he told the Sun. But they persevered. “Voting rights were a matter of life and death for black people [on trial] since only voters could serve as jurors. If there were no blacks on the voter rolls, you would end up with an all-white jury,” explained Howell, who grew up in western Tennessee and had participated in demonstrations to integrate public facilities there. The African American Coalition of Howard County was founded over 20 years ago focusing on social and political awareness of minority communities with special emphasis on research and policy advancement. It is considered a leading advocate of affordable housing, with leadership team members having served on the General Growth Housing Planning Committee and the Howard Hughes Corporation redevelopment committee for downtown Columbia, Md. Additional areas of focus include the healthcare system (including Medicaid, Medicare) and the development of African American owned businesses for the region. African Americans in Howard County is the “sister” organization of AACHC. Its primary purpose is to endorse political candidates for leadership positions and expand the public policy debate to include racial and economic equality. The views are progressive with an arc toward improving the system for democracy, freedom and opportunity for all. “Sherman has been a trailblazer and an inspiration, and I am proud to call him a friend,” said Bob Ford. 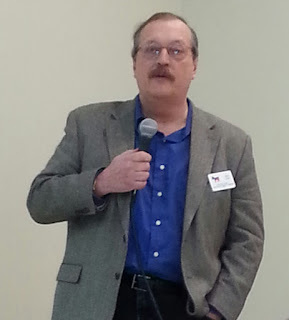 One of the major themes in my bid to remain on the Howard County Democratic Central Committee is that as Democrats, we must stand up to Trumpism and all that it entails. This is not simply a political issue, and it goes beyond the borders of Howard County. Our country’s future is at stake, and standing on the sidelines and allowing only California’s representatives to stand up to Trump is unacceptable. ►We paced ourselves and we wound up with a Muslim travel ban. ►We paced ourselves and we wound up losing DACA. ►We paced ourselves and wound up with a ban on transgender service members. 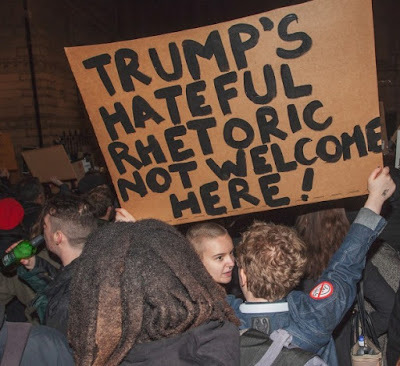 ►We paced ourselves and wound up with a spike in hate crimes against minorities since the election. ►We paced ourselves but Trump unilaterally pulled our country out of the Paris Climate accords. ►We paced ourselves and allowed the most damaging and uneven tax cut in our history that will saddle future generations in debt while enriching the wealthy donor class and large corporations. ►We paced ourselves and are witnessing on a daily basis the assault on a free press and the First Amendment. ►We paced ourselves and are witnessing the undermining of the rule of law, law enforcement, the FBI, our Intel agencies, our Justice Department and the American Judicial System. 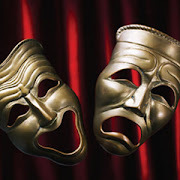 ►We paced ourselves and wound up with the most corrupt, ill-suited and incompetent administration in modern history. 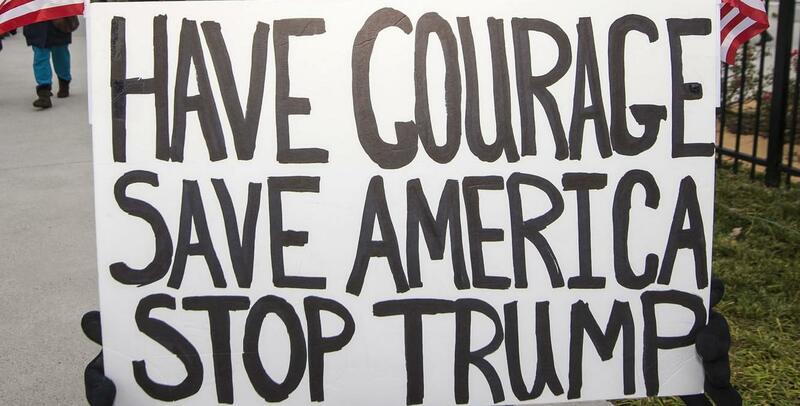 ►We paced ourselves and Americans have been subjected to continuous, non-stop lies by the president and his administration. ►Let’s not forget “the Russia thing” either. Too many local Democratic office holders and candidates have been frustratingly reticent to criticize Trump, and as a member of the Central Committee, I intend to hold elected Democratic officials accountable to those who elected them. There’s too much at stake here and “pacing ourselves” is not the answer. Vote for Bob Ford for Howard County Democratic Central Committee on June 26.